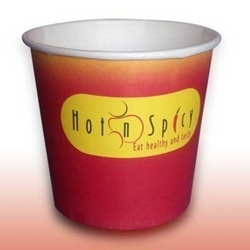 The extensive range of Coffee Paper Cups that we offer is extensively used in coffee shops and coffee houses. These cups can also be used for tea. Our range of coffee paper cups come in pleasing designs and logo print which make them highly desirable among our clients Our customization facility makes it more relevant to our client’s interests. the range comes in paper thickness of 185 GSM. To suit the specific requirement and visual value of our divergent client base we offer customization facility. We offer the range in industry leading prices. Apart from commercial establishments our coffee cups are also sought after by clients for private get together. Looking for Coffee Paper Cups ?